What is E.S.P. Fishing Tackle? Well, if you were thinking it was a new kind of tackle that would help you find and catch fish using some kind of mysterious psychic power, not quite. E.S.P. 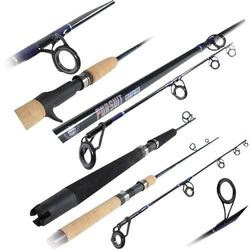 Fishing Tackle is a popular and well respected brand of fishing equipment. In fact, for many carp fisherman (and fisher women) E.S.P. Fishing Tackle is the brand of choice. Carp fishing is growing in popularity. There was a time when some considered carp "junk fish", the ones you did not want to catch, and would quickly toss back if you did. But, over the years, many anglers have come to realize that fishing for carp is a worthy past time. And for many different reasons. First and most importantly is the fact that you can eat carp, which you can't always say for a lot of the "sports" fish. True, some people fish simply for the challenge of catching a "big one". But being able to dine on the fruits of your labours adds to the feeling of accomplishment you got from catching the fish. Another thing that makes carp fishing so appealing is the challenge. Serious anglers don't want to just drop a line in the water, pull it up, and find a fish dangling on the end. They want a fish that puts up a fight. And this is definitely true of carp. Two more advantages of fishing for carp are its abundance, and the many different places they can be found. You can find these fish in streams, lakes and ponds all over the world. Wherever you live, there's a good chance there is a body of water where you can fish for carp nearby. When fishing for carp, your best bet is to use a heavy, high quality rod and reel with a 15 pound test line. Anything less could be too easily broken by the weight of one of these weighty fish. E.S.P. Fishing Tackle is a brand that offers a variety of rods designed especially for catching carp of all sizes and in many different environments. If you are interested in carp fishing, this line of fishing equipment should be at the top of your list.